Gery Hudson Porter, Chief Machinist's Mate, born Feb. 14, 1922, in Cisco, TX. He enlisted in the USN on Nov. 7, 1940, San Diego, CA. 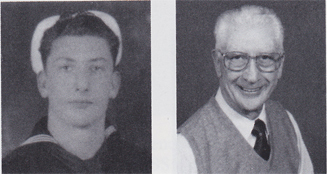 Following training at San Diego NTC and Navy Machinists School at Great Lakes, IL and the Ford Plant in Dearborn, MI, he went aboard the USS West Virginia in June 1941. Just being on the Navy's newest battleship at the time with her many impressive statistics and capabilities in itself was a notable experience. After the ship was sunk on Dec. 7, 1941, he spent the day fighting fires on board. Following the attack he served on the USS San Francisco. In July 1942 he was assigned to the USS Bogue in Bremerton, WA. Following Atlantic convoy and antisubmarine patrol duty, he was reassigned in July 1943 to the USS Langley in Philadelphia, PA. The Langley joined and operated with the Pacific Fleet(s) from early January 1944-April 1955 when it returned to San Francisco for repairs. Discharged as MMC in December 1946, his awards include the American Defense w/star, Asiatic-Pacific w/10 stars, American Area, European-African w/star, WWII Victory Medal, Good Conduct Medal, Navy Unit Citation, Presidential Unit Citation w/star and Philippine Liberation w/2 stars. Widowed in 1992, he remarried to a wonderful woman, Elsie Porter whose former husband was also a Pearl Harbor Survivor in the USS Tern. He has a daughter, Patricia, and granddaughter, Amy. He was employed as deputy chief harbor engineer, Port of Long Beach, and retired in 1981. Hobbies are photography, travel, writing, music and puttering.